Google launched its real-time search results in December 2009 and now it has revamped the service with conversation view via Twitter, location refinements, Google Alerts for updates and a whole new separate page at google.com/realtime. The conversation view feature shows organised conversations from Twitter on a specific topic which keep updating and also shows retweets. Users can click “Full conversation” below an update to access the threaded-view. Twitter is currently the main source of content within the search results, although public posts from Facebook, Google Buzz, and other social networking sites like Myspace and Friendfeed also show up in the listings. On the location front, instead of just being able to search nearby real-time updates, searchers can also now specify exact locations in the “Custom Location” box to narrow results to a particular city, state or country. Users can also click on the location listed below an update to filter results for that region. The Google Alerts feature at the bottom of the results pages allows you to click the “Create an email alert for” option and set up a Google Alert for any search term to inform you of “Updates”. Updates is a new type of alert for the status updates that Google Real-time Search indexes. Users can now receive alerts for updates on an as-it-happens, once per day or once per week basis. 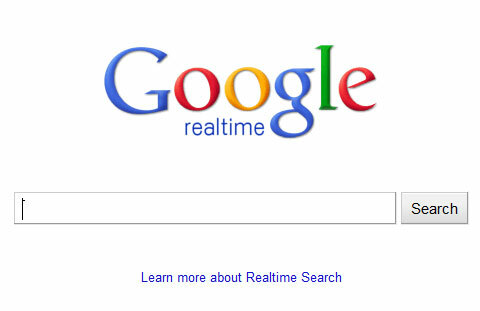 You can also access the realtime search feature via the left-hand search options menu on the main Google page.